Millhouse mug - 3⅝" (92 mm) high. 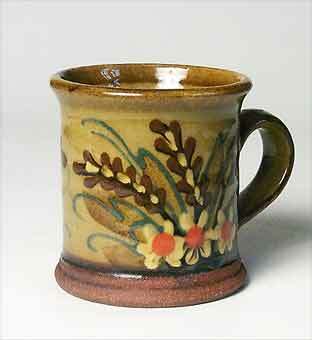 Alan Frewin, born 1935, runs Millhouse Pottery in Harleston, Norfolk with his wife, Ann. Alan's previous potteries were Nonsuch Pottery, from 1965 to 1967 and then until 1970, Alan Frewin Studio Pottery in London. Since that time Alan has been at Millhouse making thrown and press moulded earthenware pots with strong slip decorated designs and tin-glazed majolica.